Okay, everyone, tutorial time! Gather 'round, gather 'round. I somewhat blithely assumed in this post that you all knew how to roast peppers. But it was brought to my attention after the fact that perhaps a little guidance would be appreciated and I'm happy to oblige. 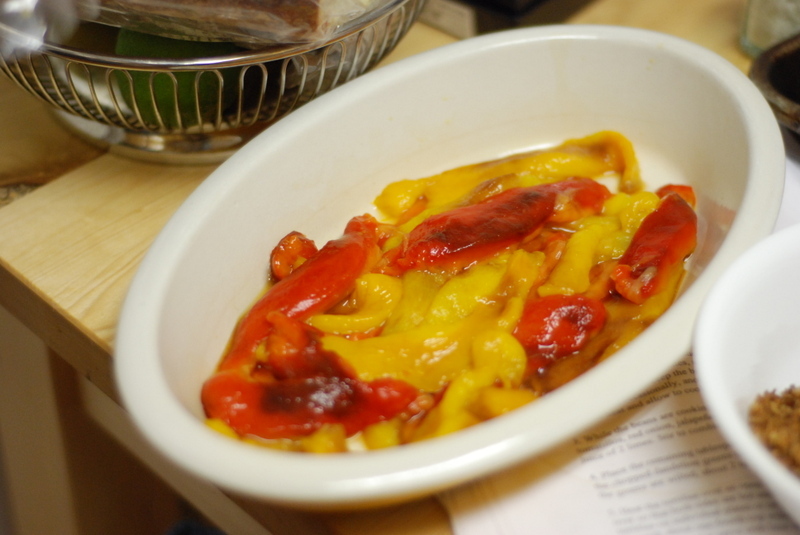 Plus, I'm on a one-woman mission to rid the world of the misconception that "roasting" bell peppers over a gas flame is somehow an acceptable substitute for when you think you don't have time for roasting peppers in the oven. Ahem. Not acceptable. Not at all. At least not in this household. 1. Preheat your oven to 375 degrees Fahrenheit. While the oven is preheating, line a half-sheet pan with aluminum foil. Wash 4 bell peppers. (I use exclusively red and yellow peppers. I suppose I could be convinced to try the orange ones every once in a blue moon. But you could not pay me to eat green ones. No way. No how.) Leave their stems on, you'll use them as little handles later in the roasting process. Place the four peppers on the sheet, leaving a bit of space between them. Place the sheet in the oven. 2. Every 20 minutes, open the oven and, working quickly, turn the peppers using their stems, so that they aren't lying on the same side throughout the entire roasting period. You'll notice each time you move the peppers that their skin has started to wrinkle and blister, even turning brown and puffing up in spots. Try to make sure that the peppers rotate evenly throughout the process. 3. 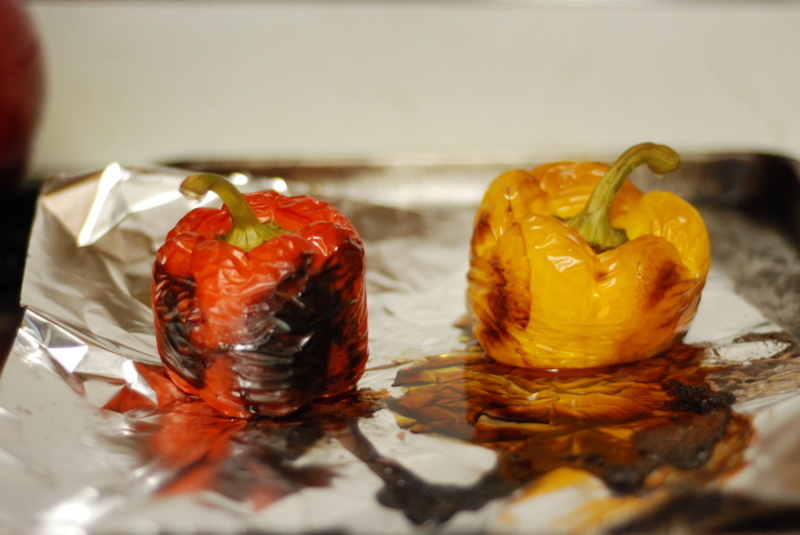 After an hour, your home will be redolent with the scent of roasting peppers. People will be knocking on your door and asking if they can come over for dinner. You will bask in the glow of roasting success. Along with a proper roasted potato, little can make you feel as capable in the kitchen as a beautifully roasted pepper. Open the oven and check the peppers. They should be evenly browned and blistered, collapsing in on themselves a bit. 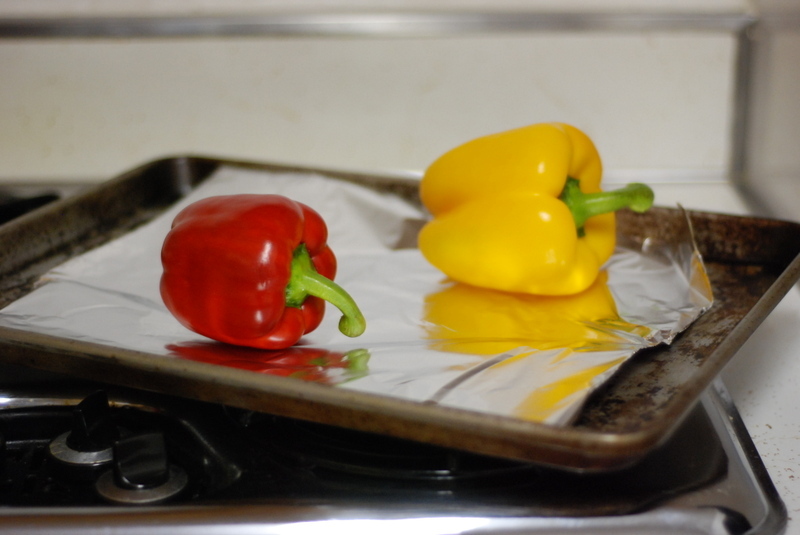 Place the sheet on a cooling rack and let the peppers cool. Don't try to fiddle with them just yet - the liquid inside the peppers is amazingly hot, even for someone with asbestos fingers like myself. Be patient. 4. When the peppers have cooled for about 20 to 30 minute, start to peel them. The peel should generally slip right off, but the peppers themselves will be quite slippery, so you'll need to do this with some care. I like to gently split the peppers and work with large sections at a time, simultaneously dumping out any of the interior liquid and, of course, ridding the peppers of all their seeds. This can get messy - I suggest working over a lipped cutting board and having a clean plate ready for the cleaned, peeled pepper segments. So! 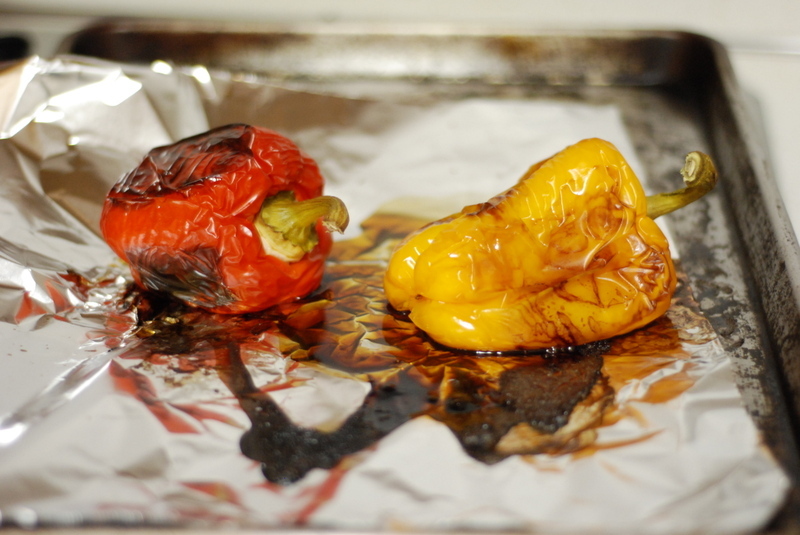 You've got yourself a nice clean plate filled with roasted peppers: now what? Cut them into strips and lay them in small casserole dish. Sprinkle them liberally with chopped flat-leaf parsley, soaked and drained salted capers, good-quality olive oil, and a generous pinch of coarse salt. Eat with crusty bread. (If you're feeling adventurous, add to this dish a small handful of slivered, oil-cured black olives and a few anchovies. Some folks even like adding a layer of homemade breadcrumbs.) This is a classic Italian dish and should be committed to memory. It improves if left to sit and stew together for an hour or two. I suppose it should be noted that these peppers are also far, far superior to any roasted pepper that comes in a jar at the supermarket. Those will never do.